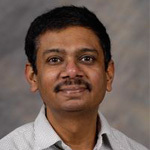 Vaithianathan "Mani" Venkatasubramanian is a Professor in Electrical Engineering at Washington State University, Pullman, WA. Mani received his D.Sc. and M.S. degrees in System Science and Mathematics from Washington University, St.Louis, MO. Mani got his B.E. (Honours) in Electrical and Electronics Engineering from Birla Institute of Technology and Science, Pilani, Rajasthan, India. Mani has been a power engineering faculty at Washington State University, Pullman since 1992. His research interests include power system stability monitoring and control.